Slim Spurling was an inventor, artist, researcher, and internationally recognized dowser. He developed the Light-Life® Ring in 1991, which became the prototype of a cutting-edge tensor technology. The science represented in the Light-Life®Technology is both ancient and modern. Quantum physics has shown us that ultimately everything is light and energy. 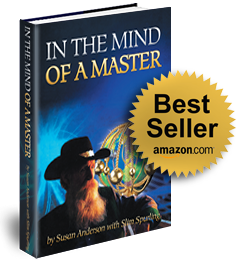 In the Amazon bestseller, “In the Mind of a Master (2012)”, author Susan Anderson and Slim Spurling discuss his extraordinary life story which ultimately led him to create the Light-Life® Tools. This comprehensive book also includes never-before-published research reports and testimonials…read more. This is Slim Spurling’s official web site and is dedicated to Personal and Environmental Wellness through recent discoveries made by scientists and ordinary people from all walks of life. We started our work with the Geobiology of Stress Reduction. This process resulted from forty years of combined research in microbiology, forestry, and herbal nutrition along with diverse experience through the studies of metaphysics, the Far East and American Native Shamanism. A rich background in applied problem solving utilizing biologic knowledge, chemistry/physics, quantum physics, bio-feedback training, psychotronic research, and extensive study in learning-how-to-learn. And, the world’s oldest personal growth approach … meditation. He developed the Functional Art Forms of the Light-Life® Tools, as the Light-Life® Rings, the Acu-Vac Coil and Feedback Loop and the Harmonizers, which support the work of environmental clearing, air pollution clearing, energy balancing, water improvement, alternative agriculture methods, insect control without sprays, beneficial insect enhancement, alternative health methods, personal self-care, computer radiation reduction, EMF pollution reduction, personal life improvement as well as business improvement. He spread the work through direct networking and has now a worldwide network with over 5,000 trained practitioners. Unauthorized reproduction of this technology is occurring now in several locations around the world using often our product names, sometimes with additions. Even though those devices may look like ours they may have unpredictable and/or adverse effects. To make sure you are purchasing from an authorized distributor for Slim Spurling’s Light-Life(R) Tools please go to ‘Find a distributor’. IX-EL Inc. is the only authorized manufacturer for Slim Spurling’s Light-Life(R) Tools. Acu-Vac Coil, ½ Cubit Light-Life® Ring.